Posted on April 7, 2016 at 5:58 am. Researchers in France have customised a drop tower to simulate landing a CubeSat on an asteroid in the near-absence of gravity – part of the preparations for ESA’s Asteroid Impact Mission. “We’ve taken an existing drop tower, previously designated for aircraft and material drop-tests, to simulate a low-gravity landing,” explains Naomi Murdoch of the Institut Supérieur de l’Aéronautique et de l’Espace (ISAE-Supaero), part of the University of Toulouse. “The ISAE-Supaero Space Systems team, in collaboration with the Department of Mechanics of Structures and Materials, rigged up a system of pulleys and counterweights to simulate reduced-gravity. “We can go down to a few percent of Earth’s gravity within the test box we drop, to see how the lander interacts with our simulated sand-covered asteroid terrain. Rosetta’s Philae lander showed just how tough a low-gravity touchdown can be: immediately after reaching the surface of its target comet, the lander twice bounced back up into space, finally coming down to rest nearly two hours later. While Philae’s comet measures around 4 km across, the asteroid target of ESA’s Asteroid Impact Mission (AIM) is just 170 m in diameter – around the size of the Great Pyramid of Giza – so its gravity level will be correspondingly weaker: several million times lower than Earth’s. Didymoon’s escape velocity would be of the order of 5–10 cm/s. 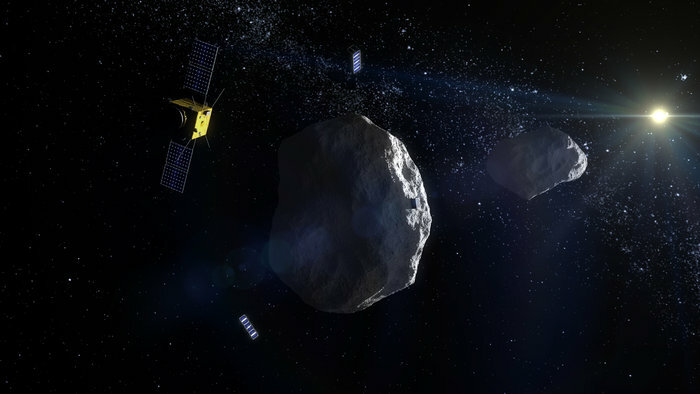 AIM is a deep-space technology-demonstration mission proposal that would also be humanity’s first probe to rendezvous with a double asteroid, the Didymos system. Equipped with a microlander for the smaller asteroid ‘Didymoon’, AIM would also carry a pair of triple-unit CubeSats – nanosatellites based on standardised 10 cm-sized units, which are much cheaper and simpler to build than standard satellites. Research teams across Europe submitted proposals for these first European CubeSats to operate in deep space, intended to boost AIM’s science and technology demonstration goals. Five proposals have been chosen by ESA for detailed study. David Mimoun, Associate Professor at ISAE-Supaero, explains: “The research we are doing is for the AGEX mission consortium – combining the Royal Observatory of Belgium, ISAE-Supaero, EMXYS, Antwerp Space and Asteroid Initiatives Ltd in the US – with one CubeSat lander and a second CubeSat dispatching still-smaller ‘chipsats’. “Our lander would be equipped with accelerometers to capture the details of its surface interaction as it lands, to find out more about the mechanical properties of the asteroid surface. “Then, once safely down, the CubeSat will use geophones to study the asteroid’s seismic activity and interior structure – do thermal and tidal shifts over the course of Didymoon’s orbit trigger seismic events? “The AGEX lander would provide a direct test of Mascot-2’s deployment and landing strategy at Didymos and our current research will help with planning the landing of both the CubeSats and Mascot-2,” concludes Dr Murdoch.